What do I need to do during implementation, what is required from me? Prior to the implementation we will discuss the number of trading partners you have, and their ID’s. Depending on your communication method you, or your team, may be assist in a communications test. During the implementation you just watch the data flow into and out of your system. Also, you can check our dashboard to see the status of each trading partner in real time. What do my VAN Trading Partners Need to Do? Your VAN trading partners do not need to do anything. We handle everything at the VAN level. The only exception is a very small number of trading partners (Caterpillar comes to mind) that require connectivity testing, but we have done this many times and will complete this in no time. What do my AS2 Trading Partners Need to Do? In all likelihood, we already have AS2 connections with your AS2 trading partners, so once the AS2 connection information is exchanged they can be switched to BOLD VAN. And if we don’t already have it, we will work with your trading partners to establish the connection prior to cut-over. On the Day of Implementation, How long does it take to Migrate Trading Partners? Our typical implementation starts at 10:00 in the morning and is completed by noon. What about Trading Partners with Multiple IDs? Not a problem! Typically, the difference is at the GS level which means they are all considered to be one partner (even if they are considered many partners by you, internally). If the difference is at the ISA level, each one would be considered a separate partner. You data will not change, as a result, your maps are fine just the way they are. What about my ID’s? What about my Trading Partner ID’s? ID’s do not need to change, they will migrate perfectly, just as they are! Doesn’t every VAN charge by the Kilo Character? Not anymore. BOLD VAN is unique. We do not count KC’s (Kilo Characters); as a result, you are allowed to exchange unlimited KC’s per month. Pricing is based solely on the number of trading partners that transmit data within a given month. Do I really get unlimited data? Yes! BOLD VAN is revolutionary. We are the first company to mass market trading partner based pricing. We do not bill by the Kilo Character. The result is that you get to send and receive unlimited data. Who is a good fit for BOLD VAN? With our trading partner pricing and virtually infinite capacity BOLD VAN is a perfect fit for any company looking for a simple, predictable, and easy to manage value added network. What is an EDI Trading Partner? At BOLD VAN a Trading Partner is defined as a unique ISA Sender / Receiver ID combination. We do not consider GS ID’s in this calculation. For example: Let’s say your company has a single ISA ID and you exchange documents with Wal-Mart and Target in a given month. This counts as two trading partners. To take the example further, let’s say you support EDI for two separate businesses, each with their own unique ISA ID, and each of them exchanges documents with Wal-Mart and Target in a given month. This counts as four trading partners. Am I Billed for Every Trading Partner Setup in BOLD VAN? It does not matter how many trading partners you have set up on our system, you will only be billed for the trading partners you exchange data with for that given month. Do you charge extra for AS2 trading partners? No, there is no extra charge for AS2 trading partners. Our trading partner has one ISA ID but many GS ID’s, how is that priced? BOLD VAN only counts unique ISA Sender / Receiver ID combinations; a unique ISA Sender / Receiver ID combination with multiple GS ID’s counts as a single trading partner. We have one ISA ID but many GS ID’s, how is that priced? BOLD VAN only looks at unique ISA Sender / Receiver ID combinations; a unique ISA Sender / Receiver ID combination with multiple GS ID’s counts as a single trading partner. Yes! Your data is hosted within secure datacenters. This platform ensures any and all compliance and regulatory and compliance restrictions are met for any industry. BOLD VAN also provides secure connection methods for data in transit. Please Contact Us! What is BOLD VAN’s uptime? BOLD VAN is built on a robust platform that connects tens of thousands of trading partners exchanging nearly 2 million interchanges per month. BOLD VAN boasts better than 99.998% uptime over the last 10 years. VAN stands for Value Added Network. It is essentially a virtual post office consisting of mailboxes belonging to you and each of your trading partners. Data is routed between mailboxes based on ISA Sender / Receiver ID. EDI stands for Electronic Data Interchange. At a very high level, EDI is the electronic exchange of documents. EDI enables automation and integration. It provides standards for the formatting and exchanging of documents, and is meant to work regardless of the platform or systems used by the sending party or the receiving party. A VAN helps enable this process by providing the means of transmission of these documents, not unlike a post office enables the sending of letters and other types of documents. AS2 is a method to securely and reliably transmit data over the internet using certificates and encryption. How do I connect to BOLD VAN? I need to support multiple organizations, is this supported? Yes, you can have as many companies, divisions, etc. as you like. The pricing model does not change: a trading partner is any unique ISA Sender / Receiver ID combination. Do I have to change my ID’s, Qualifier? No. BOLD VAN will migrate your ID’s for you. What if I don’t have an ID yet? No problem! BOLD VAN will provide you with an ID and Qualifier. What do my EDI Trading Partners have to do? Nothing at all! The change is handled at the VAN level. Your trading partners will continue to send data to their VAN as they always have. What do my AS2 Trading Partners have to do? If you are migrating from AS2 to BOLD VAN there is an extra step that needs to be taken; a form needs to be completed and submitted. We will help you fill out the form and your migration will be complete in no time! How much lead time is needed to migrate to BOLD VAN? Migrating to BOLD VAN typically takes a few days, depending upon your needs. Contact Us to schedule your migration to BOLD VAN. Do my trading partners need to use BOLD VAN? Absolutely not, BOLD VAN connects to your trading partners whether they are on BOLD VAN, AS2, FTP or another VAN. Can I send a copy of documents to another mailbox or trading partner? Yes, this process is referred to as a Carbon Copy. EDI Carbon Copies are available through BOLD VAN. Who are some of the trading partners supported? BOLD VAN currently supports approximately 20,000 EDI trading partners and new trading partners are being added every day! If EDI data is being sent, we support it. What are some of the industries supported? We support data from any industry. Do you cover Wal-Mart and/or Sam’s Club? Yes, sign up now and we’ll have you connected in no time! See the Wal-Mart page for more info. Do you charge extra for Wal-Mart and/or Sam’s Club? No, even Wal-Mart and Sam’s Club are included in our standard pricing. See the Wal-Mart and Sam’s Club pages for more info. Don’t I need AS2 for Wal-Mart and/or Sam's Club? Yes, and we can help. Please Contact us for more info. What about Retail Link? Wal-Mart EDI testing? Call today, BOLD VAN is here to help you through each step of the process. See the Sam’s Club page. How many AS2 retries do you do, and how often? By default we do 10 min retries and 72 hour timeout. This is configurable to whatever you and your team prefer. What if I'm currently doing AS2? Perhaps for the first time ever, a VAN is a viable economic alternative to AS2! What standard of EDI is supported? What version of EDI is supported? 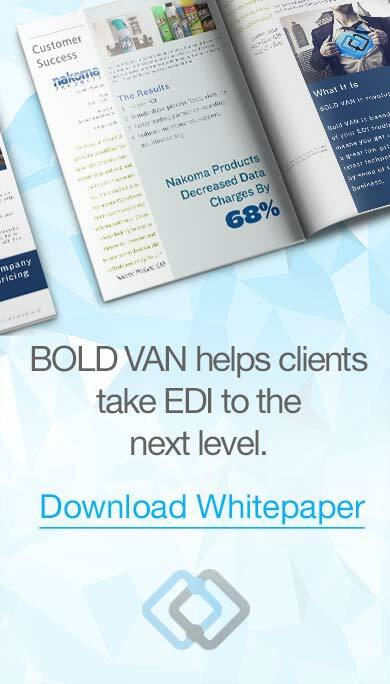 You can send any version of EDI through BOLD VAN. Can I send Non-EDI Documents? Absolutely! Please call to learn more. Yes, BOLD VAN supports EDIFACT, ANSI X.12, X.400, ODETTE, TRADACOMS, and other formats. Simply login to our portal and your inbound and outbound will be visible. How long is my data visible? Most VAN’s provide a couple of weeks of data. BOLD VAN provides 90 Days! Is there a charge to view my data within 90 days? No charge! Simply login to our portal and search for documents. How do I find documents after they have been sent? Log into our portal and utilize one of our many search criteria to find your document(s). Can I view the contents of messages via the portal? Yes, you can open EDI documents and view them online. Can I reprocess inbound documents? Yes, you can reset and re-download inbound documents for free, via our portal. What if I need access to data older than 90 days? Data is archived after 90 days. Current clients can be given access to data up to seven years old. There may be a charge to access archived data. Support is available by calling (844) BOLD-777 or emailing support@boldvan.com. Typical support hours are 8:00 A.M. Eastern to 8:00 PM Eastern; however, we understand that EDI data transmission can be mission critical. On-call support is available 24/7 for production-down type issues. What if I need help with data translation? We have the answers you need. Please contact BOLD VAN. Do you sell an EDI translator? We can show you the best options. Please contact BOLD VAN. Can you help with mapping?